Urgent message: Although measles was declared eliminated in the United States in 2000, outbreaks continue to occur, with unvaccinated travelers most often being the carriers and transmitting the disease to clusters of unvaccinated individual residents. According to the World Health Organization, 145,700 people around the world died of measles in 2013, which equates to 400 deaths per day or 16 deaths per hour. Measles remains one of the leading causes of death in young children worldwide. In 2011, the Centers for Disease Control and Prevention received reports of 200 measles cases in the United States. In 2013, 189 cases were reported, and in 2014, a record 644 cases from 27 states were reported. Between January 1 and February 6, 2015, more than 120 cases of measles in more than 12 states have been reported. Most have been linked to an outbreak that began in December 2014 at Disneyland in California. 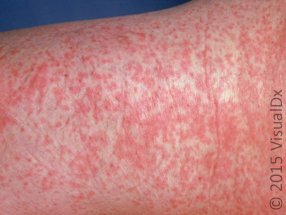 Measles (rubeola) is caused by a single-stranded RNA virus of the Paramyxoviridae family. The disease is worldwide in distribution, with sustained outbreaks being reported in many countries. Cases are more common in developing countries, because the majority of individuals in industrialized nations have been vaccinated. The infection primarily occurs in late winter and spring. The disease is seen more often in children than in adults. In an unvaccinated population, children younger than 5 years are at highest risk of infection and death, usually because of a respiratory or neurologic complication. Measles is transmitted via respiratory droplets, and it is highly infectious. The incubation period after the measles virus enters the upper respiratory tract and nasal passages is about 10 days (range, 7–21 days), with the rash typically appearing about 14 days after a person is exposed. Infected individuals are considered contagious for the time period encompassing 4 days before rash appearance to 4 days afterward. A prodrome characterized by coryza (nasal congestion), cough, fever (up to 40.5°C), and conjunctivitis lasts for 3 to 4 days, and rash onset follows. However, sometimes immunocompromised individuals do not develop a rash. The coryza, “barking” cough, and conjunctivitis will increase in severity until the rash reaches its peak. 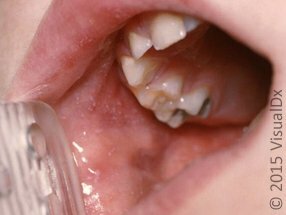 Oral lesions called Koplik spots (Figure 1) may develop 2 to 3 days after symptoms begin and prior to the generalized rash eruption. 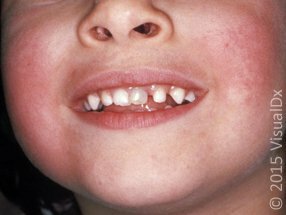 Look for small white papules that may have a central bluish-white speck, usually opposite the second molars on the buccal mucosa. They may also be red. Bluish-gray or white spots can also be seen on the tonsils. 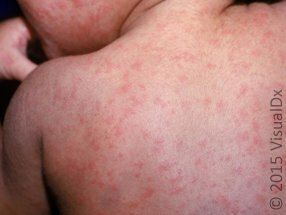 The measles rash consists of erythematous macules and papules beginning behind the ears and at the forehead, spreading down the neck to the upper extremities, trunk, and finally the lower extremities, a process called centrifugal spread. Confluent lesions can occur on the face. 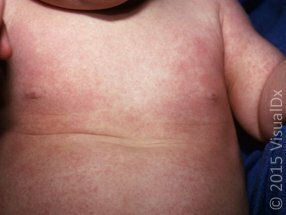 Figure 2 shows the measles rash in children, and Figure 3 shows the rash in adults. 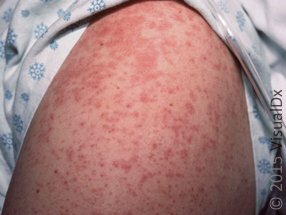 In atypical measles, which occurs in those who received killed-virus vaccine or in those in whom immunization failed, the rash will spread from the extremities inward (Figure 4). 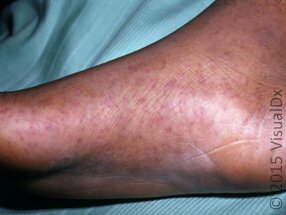 Petechiae, vesicles, or papules can occur. Cough and conjunctivitis are not as prominent as in typical rubeola. Treatment is supportive, focusing on relieving common symptoms and providing nutritional support, including vitamin A supplementation. Supplementation is recommended for children in areas where the case fatality rate is more than 1%, in areas where residents are known to have vitamin A deficiency, and in cases of severe, complicated measles. Reporting is regulated by state health laws and regulations. All U.S. states require that measles cases be reported. Acknowledgment: Images and report courtesy of VisualDx (www.visualdx.com/JUCM). Also see the webinar “Spotting Measles” from VisualDx at http://youtu.be/1DaXWIA1WZA. Figure 2. 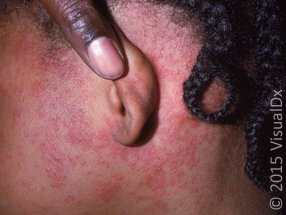 Measles rash in children: (A) on the face and head and (B) on the back. Figure 3. 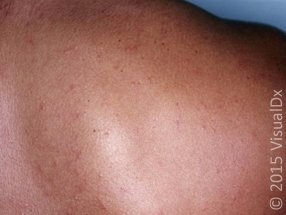 Measles rash in adults: (A) on the extremities and (B) on the back. Figure 4. 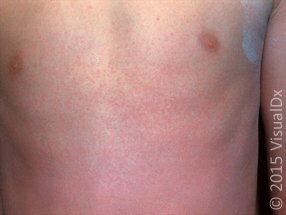 Rash in atypical measles. Figure 5. Infectious mononucleosis. Pharyngitis and adenopathy are more significant in this disease than in measles. Figure 6. In erythema infectiosum, the rash begins as bilateral erythema of the cheeks (“slapped cheek” appearance). Figure 7. 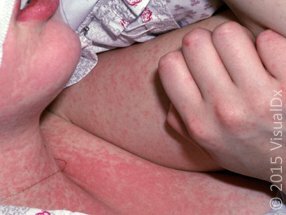 In roseola, the rash typically begins on the trunk and may spread to the neck and upper and lower extremities. Figure 8. Rubella. Before the onset of rash, pain on lateral or upward eye movement is common. Figure 9. 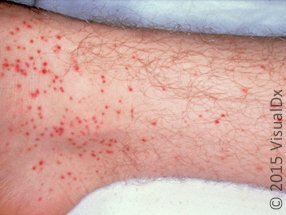 Rocky Mountain spotted fever, usually transmitted by travelers from an area where the disease endemic or contracted by residents of such areas. Figure 10. Patients with an enteroviral infection may have accompanying nonspecific symptoms. Figure 11. 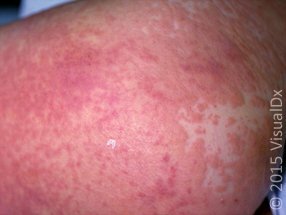 In Kawasaki disease, the rash is nonspecific and polymorphous (not pustular, not vesicular); it may start in the groin. In the mouth, look for “strawberry tongue” and red, fissured lips. Conjunctivitis is bilateral and nonpurulent. Figure 12. Drug-induced exanthema. Onset is usually within 7 to 14 days of initiation of a course of oral medication. Figure 13. The onset of drug hypersensitivity syndrome or drug reaction with eosinophilia and systemic symptoms is usually between 1 and 8 weeks after starting a drug for the first time.